When you enter a shop, a bank, even a car dealership, what’s your expectation for being served or even acknowledged that they’ve seen you and will be “with you shortly”? 1 minute, 5 minutes, 10 minutes? How long before you walk out and go somewhere else? According to a TimeTrade survey of 973 retailers, the average person isn’t willing to wait more than 5 minutes for service. Many walk out (or abandon their online enquiry) without buying anything, go to a competitor, and often complain about it online. Not only has the retailer lost this sale – they’ve also jeopardised future sales, and suffered public brand damage. Interestingly, 80% of these retailers also reported that when customers are assisted by (in-store or online) employees, their sales increased by between 25-50%. A 2014 American Express survey found that the maximum amount of time customers were willing to wait to be served in a contact centre was 13 minutes. Fast forward to 2017 – and a further study found that people aren’t willing to wait that long anymore. Almost two-thirds said they would wait two minutes or less and 13% said that “no wait time is acceptable.” And it isn’t just millennials being impatient – a whopping 74% of those 65 and over would not wait even two minutes. In busy times, particularly during special promotions, this could mean quite a high Call Abandonment rate, resulting in lost sales now and for the future. To investigate this in a sales context and quantify possible lost sales opportunities, we’ve developed a hypothetical scenario. NOTE: If your Contact Centre solution is equipped with a good IVR system and quality historical reporting metrics, it’s easy to replace these hypothetical numbers with your own to gauge your potential revenue losses due to abandoned calls. 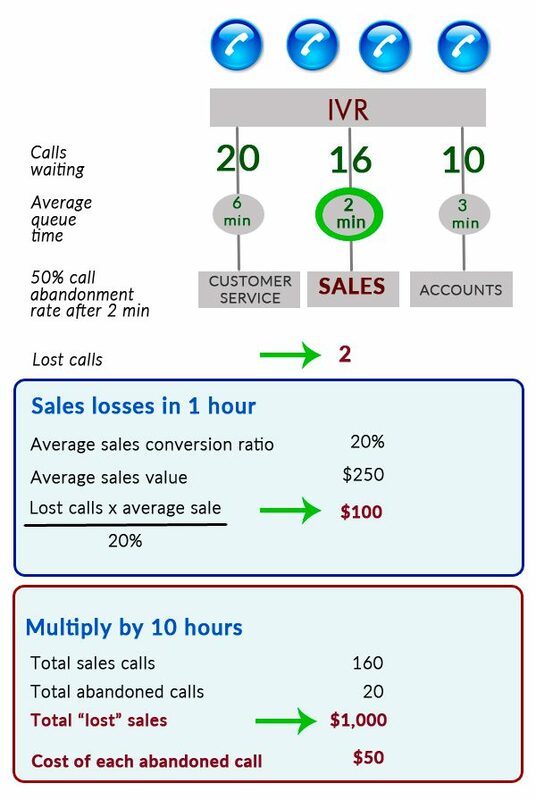 In this scenario, we’ve assumed that 50% of people making inbound calls to the sales department will abandon after two minutes. We’ve also assumed an average 20% close rate, an average order value of $250, and 160 inbound sales calls per day. This scenario shows a potential $4,000 daily loss in sales. Each abandoned call is costing this business $50. To reduce the possibility of revenue losses, there are three things you can do to reduce abandoned calls. 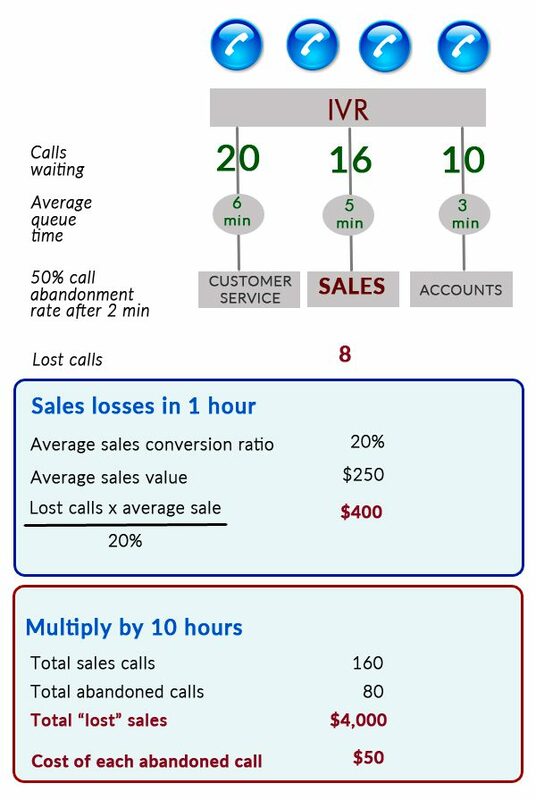 As we can see from Figure 2 – if the average queue time is reduced to 2 mins, the abandoned call rate should be a lot less, and consequently if all else stays the same – revenue increases by $3,000 per day. 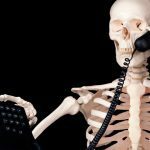 If your team leaders see a spike in incoming calls – act fast to meet demand and reduce queue times. Premier Contact Point makes it easy to switch outbound agents over to assist the inbound team during peak demand periods. 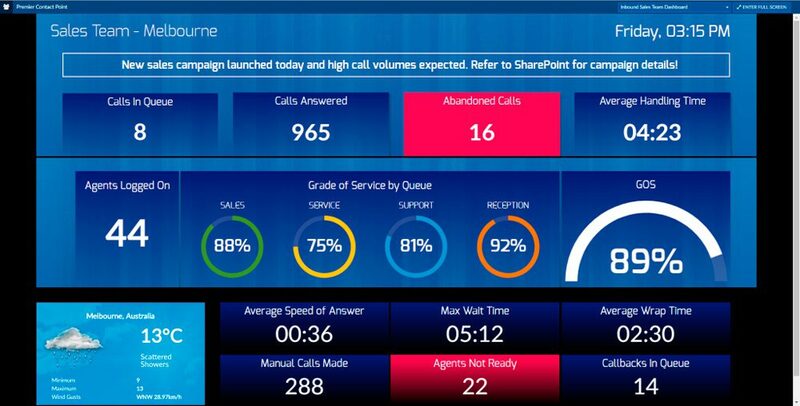 Using dynamic, colour-coded wallboards, Team Leaders can track activity in real time and monitor vital call metrics such as sales, average speed of answer, queues, wait times, calls handled, wrap times, call back queues, agent break times and a whole lot more. When your Marketing Department advises you of an upcoming promotion, plan ahead to roster additional staff to meet the expected peak in inbound traffic. Even during normal periods, without special promotions, chances are you will have inbound call peaks and troughs every day. Use the valuable insight reports and predictive capabilities of a solution like Premier’s Workforce Management to create accurate demand forecasts and baseline staffing levels. You can also overlay baseline levels with agents’ skill sets and availability to schedule the right mix of staff at the right times. For example: if you notice a spike in sales calls between 12-2PM and 4-6PM, roster extra staff on for these periods. The number of extra staff you will need will depend on call volumes and your waiting time targets (eg: less than 2 minutes). Do the sums to work out the cost of extra staff, and expected increase in sales from reduced abandoned calls, to determine if it’s worthwhile. A cost-effective way to reduce the financial effect of abandoned calls is to use call-backs to defer calls until a later time. There are two options for call backs. 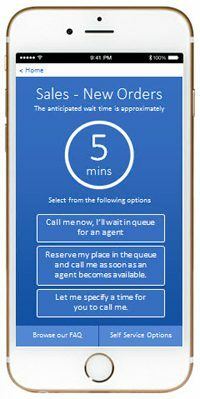 A regular call-back where the customer’s place in the queue is held and she is called when her turn arrives – ie: “virtual queuing”. A timed call-back, where customers are offered a selection of time slots for their call-back. This option allows you to schedule the call back to take place during a “trough” period, and so keeps staff productive during quieter periods. Call back options can be offered through your IVR for inbound calls, or if you’re using the Premier Contact Point Mobility Solution – the call back options can be presented on the user’s mobile phone. Doing everything you can to reduce waiting time shows your customers that you really do value them, and respect their time. Keeping them waiting for longer than a couple of minutes does not. They’ll soon let you know how annoyed they are – when they hang up their phone and take their wallet elsewhere. Interested in our client case studies on call abandonment? If you’d like help reducing abandoned calls and making your contact centre operate a lot more efficiently, give us a call on 1800 85 84 83 or complete the form below. We’d be happy to schedule a call at a time that suits, and share case studies of clients who have reduced their call abandonment rate, and enjoyed increased sales. Interested in reducing your abandoned call rate?